A word from our founder. Let's go back . . . . I'm David Frazier, founder of ERG. I love music. I mean I REALLY love music. For as long as I can remember music has been a huge part of my life. From the day I was adopted as an infant my Mom would sing to me along to her collection of albums. She said that as a baby, I'd put my hands on her throat so I could "feel" the sound as she sang. Nurturing my attraction to music, my parents bought me musical instruments around age 1. I was playing (chuckle) the guitar, piano and drums by age two and there was no turning back. I followed the typical musical path, excelling in high school band, playing in high school garage bands and DJing all the school dances and private parties I could . . .anything to be making music and amplified sound. Over the years to come I was fortunate to have the opportunity as an entertainer to travel the Southeast, sharing the stage with literally hundreds of regional national acts and playing bass with groups like The Platters while performing for the Governor of North Carolina. These experiences also opened the door for me to be able to work in radio and television, being heard on Triad NC airwaves and on WHGP-TV reporting traffic mornings and afternoons. Every minute of that time provided an invaluable education in audio, lighting, event production and how to best deliver them to an audience. A different path . . .
Life on the road is exciting. It's also grueling and physically demanding. In the mid and late 1980's I owned ProSound Entertainment, Inc., a successful production company. Although it was exhausting work, it allowed me to cross paths and partner with Kevin Johnston, a talented musician and DJ. I know God placed Kevin in my path for a reason. More on that in a minute. Knowing I had a God-shaped hole in my heart and burned out from the rigors of the road, I rededicated my life to Christ and sold ProSound Entertainment, making a lateral transition into the tech and IT field. God blessed me with the love of my life, Sally Voelkert, whom I married in 1997. Then in 2002 we adopted our son Paul. Working in IT, I continued to DJ, perform in bands and do sound reinforcement while also playing full time in the church praise band. I lost both parents in 2017; my Mom suddenly and my Dad after an extended declining illness. That will make you stop and quickly reassess your priorities. This brings us to current day and the Genesis of ERG. Retiring in March of 2018 I found myself in a unique situation. For the first time in my life I had free time and could choose to do the things I "want" to do; those things I enjoy most. 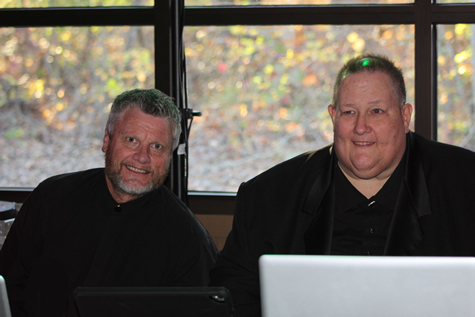 Since retiring I have been flooded with requests related to my passions . . "Dave, do you still DJ weddings?" or "Hey Dave, do you still do sound?" and so on. As I began to reconnect with audio and lighting again, I found that not only did I really, really enjoy it, but I had actually missed doing it. At the same time, my lifelong friend and former partner Kevin Johnston, also a fellow follower of Christ called me and said "Hey, I'm moving back to Lexington to be close to my grand kids. I really miss the old days. I wish we could do that again. We were so good at it". OK God, I hear you. You got my attention. Seeing a need for quality, cost-effective event support company Kevin and I decided to form Event Resource Group. We're a locally owned Christ-centered company, with our goal being to support the end user who might not require the services of a large production vendor. It is our goal to set a new standard in providing professional event services. We also support worship leaders and praise bands who spread the good news. Although we're a newly formed company, we bring 60+ years of combined experience to our clients.